It’s swarming season for honeybees. It is their natural method of expanding colonies and May is the perfect time for them to do it. 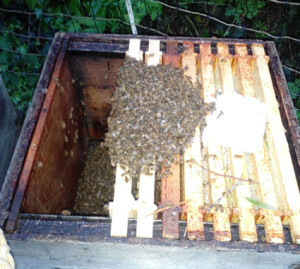 A swarm now will have enough time to establish a new home and build up stores for the winter. The downside is that swarms in towns and cities are unwanted and often pick inconvenient places for their new home. This is where beekeepers around the country come in. We operate a swarm collecting service and last night was my turn to go collect. Some swarms can be in the most difficult of places to reach, I heard of one last week between the roof lining of a church, some 30ft up. The swarm I was called out to last night was at the other end of the scale, hanging 4ft off the ground in a laurel bush next to a driveway. There are about 10,000 bees here, a medium sized swarm. They are at their most docile, full of honey and only interested in establishing a new home. Problems come when animals brush by or small children poke them with a stick. There is nothing scientific about the process of removal. The key is to get the queen and the others will follow. 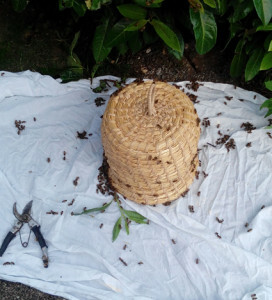 I held my skep under the swarm and then gave the branch a sharp knock. If you just shake then the bees will instinctively hang on. The bulk of the bees simply drop into the skep. 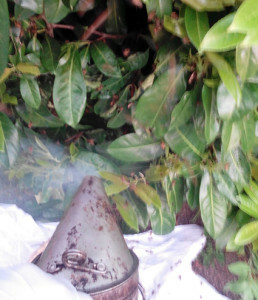 Then all you need to do is turn the skep over onto a sheet and leave for a few minutes for the bees to settle. Some bees will instinctively return to the branch. This isn’t usually a problem as, without a queen, they will ultimately drift away. 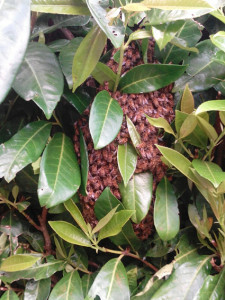 However, as this swarm was outside a house I wanted to make sure I had cleared as many bees as possible, so that there was no risk of anyone being stung. I used smoke to push the bees away from the branch, disguising the remnants of the queen’s smell and driving them down to the rest of the colony. After about 30 minutes, by which time the bees have settled into the skep, it is wrapped in the blanket and taken away. This is only half the story, as they now need rehousing. 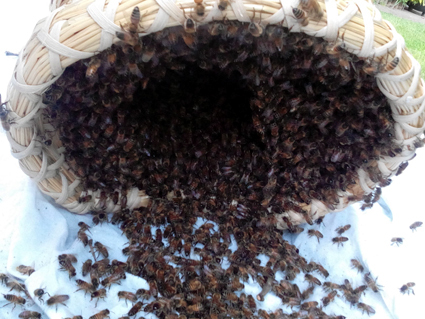 Below you can see the bees hanging inside the skep, it is pretty full. 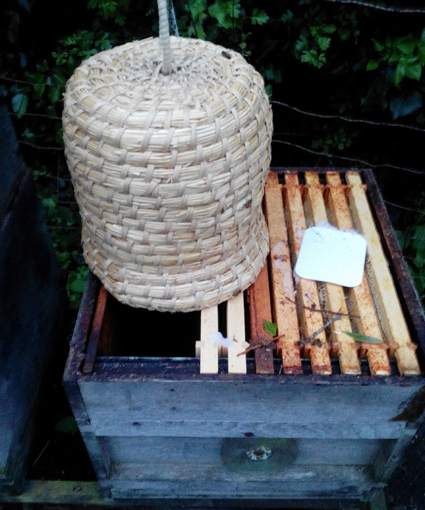 A hive is then prepared, with some new and some old frames, and the skep placed over it. Finally another sharp knock on the skep and the bees fall into their new home. I will now leave them alone for a couple of days to settle down before taking another look at them.